The upcoming referendum on whether or not the UK will remain a member of the EU has propelled a renewal of academic economists’ interest on the political economy of the UK-EU relationship. This is largely because the possibility of a British exit, or ‘Brexit’, is one among a constellation of crises currently inflicting upon the EU. Although one among many, Brexit differs in that it can alone and fully ignite other crises. Brexit raises existential questions about the integration project. It asks questions about the value of membership, the dynamics and distribution of its benefits and costs, and the type of integration that can at least sustain the net benefits we have seen since the 1950s. One of the few benefits of the ‘Brexit debate’ is that it has fostered a flurry of new research addressing hard and important questions that have not been sufficiently investigated previously. The aim of “The Economics of the UK-EU Relationship” conference, held at Brunel University London on 3 June 2016, was to take stock of some of this new research. This column summarises the presentations and includes several videos recorded at the event. In a complementary presentation, the authors of this column offered new historical evidence on the net benefits of EU membership to the UK. We date the key turning point in per capita GDP in post-war British economic performance at around 1973. Yet, evidence of a turning point is even stronger for total factor productivity (Figure 1). 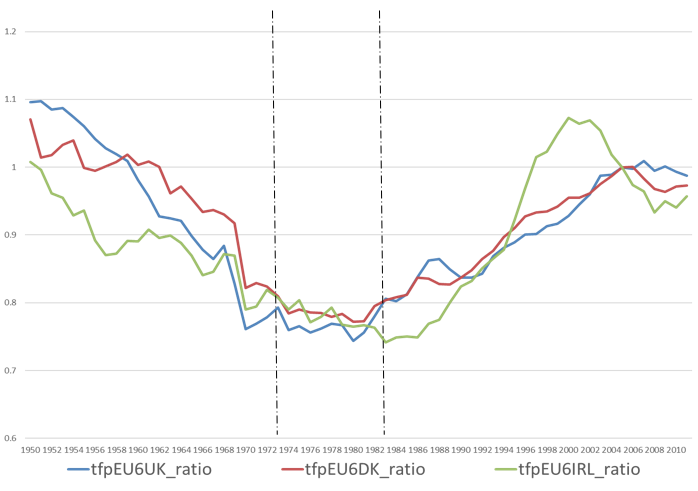 This suggests EU membership not only helped in the late 1960s to reverse the relative decline, but also help propelling the rebound from 1970s onwards (even more so than Margaret Thatcher’s reforms). Angus Armstrong (NIESR) focused on the role of financial services. He contrasted the current UK financial infrastructure with how such infrastructure might look like post Brexit. He noted that the UK has a systemically large domestic banking system (different from Luxembourg, for example), so regulation plays differently. He highlighted the issue of the of emergency liquidity assistance provision. Unusually, Eurozone infrastructure extents to the EEA, which allows the UK to be centre of euro wholesale finance. Randolph Bruno (UCL) presented a clear example of a research issue that has benefited from the Brexit debate. The effects of EU membership on foreign direct investment is a topic of obvious importance but one for which previously we had very few estimates. Now, thanks to the ensuing flurry of new research (of which his Bruno’s paper is part), we have a better grasp of the issue. Bruno’s main finding is that EU membership caused an increase in FDI inflows of about 28% on average, with the UK being one of the countries with a clearly above-average effect. Peter Egger (ETH Zurich) noted that the EU spends a large share of its budget on regional policy. His research concludes that overall regional transfers across the EU give value for money. However, there is room for further improvement in the design of EU regional transfers to make them more effective. He argues that UK regions have benefited from EU regional policy over the last decades and that there is uncertainty for those regions that benefit from substantial amounts of EU funding (e.g. Cornwall) over what would replace those funds after an eventual Brexit. Jan Fidrmuc (Brunel) presented new research adding to the vast academic literature on immigration, wages, and employment in the UK. He noted that despite being voluminous, this body of econometric evidence still has some important gaps, in particular in trying to fully exploit the time-series dimension in order to try to make causality statements. Using quarterly data for a panel of UK regions since 2004, he argued there is no evidence of lagged effects between immigration, on the one hand, and wages and employment on the other. Corrado Macchiarelli (Brunel) presented lessons from the history of European monetary integration. He contrasted OCA and optimal control perspectives on European integration and noted the latter allows for considerations about loss of sovereignty. He examined the role of European integration for the future of EU-UK relations and, more specifically, the implications of ‘completing’ the European Monetary Union. Because a ‘Genuine Economic and Monetary Union’ (GEMU) would affect the UK irrespective of Brexit, it should be taken into the account for the costs and benefits of EU membership.